The Bradford Rattlers won both their games through the weekend. First was a road trip to Toronto to take on the Predators on Saturday followed by a home game against the expansion Grey County Grizzlies. In Toronto, the Rattlers pulled off a close 3-2 victory over the Predators. First star of the game was goaltender Patrick Bosiger who made 33 saves. Scoring for Bradford included Forward Louis Chaix, the Rattlers 2015 First Round draft pick Nicholas Lang from Slovakia with veteran Rasmus Brunnberg scoring the game winner goal with five minutes remaining in the third period. 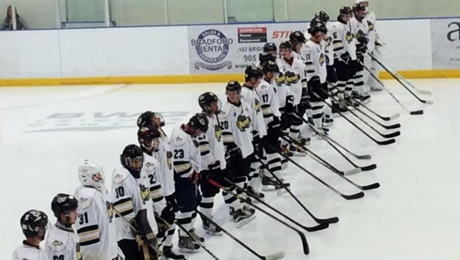 This past Sunday at Home, the Rattlers hosted the Grey County Grizzlies breaking out offensivly to win 9-1 final. Chris Boyd had his first start of the season between the pipes. Up front, Rasmus Brunnberg had a career high 5 point evening while Devon Fullum had four points of his own. Goal scorers against the Grizzlies included: Fullum (2), Larsson (2), Brunnberg, Al-Dzhilaui, Kurbatov, Irvine, Babcock. The Rattlers are sitting in second place in the Central Division with a record of 2-0-1. Only the Alliston Coyotes remain ahead of the Rattlers for first place. Looking forward, the Rattlers are preparing this week for a big match against the Grey Highlands Bravehearts. Life time head-to-head, the Rattlers have 25 wins and just 10 losses to the Grey Highlands team. Puck drop is 7:30pm on Sunday, September 27th at the BWG Leisure Centre.